This black and white photograph shows Gasper Christopher Clemens. A Topeka attorney who represented clients from all walks of life whom were believed to be falsely accused or denied their personal rights. Clemens also gained the reputation as a lecturer who discussed the political issues of the day. When the Populist Party gained momentum in Kansas, Clemens became an active member and served in several positions. One of those positions was legal adviser to Populist Governor Lorenzo D. Lewelling, and the other as court reporter to the Kansas Supreme Court. His battle for justice and equality for the common man prompted Clemens to break away from the Populist Party, in 1897, and to organize within the state the Socialist Party. In 1900, Clemens became the Socialist candidate for Kansas Governor and received about 1,200 votes. With this encouragement, he became the 1902 Socialist candidate for attorney general but was unsuccessful in his bid. 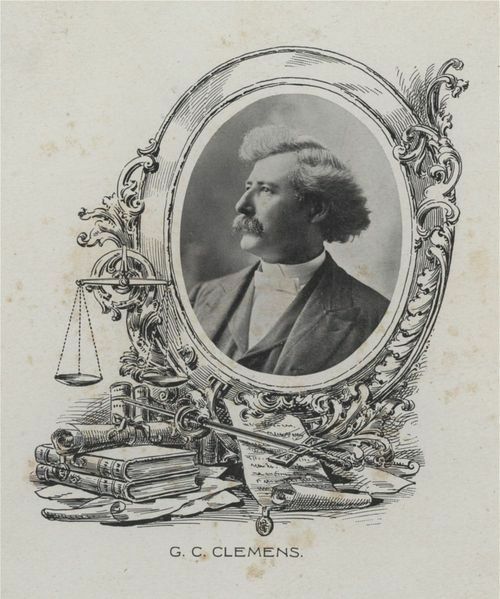 After his defeat, Clemens returned to his law practice to advocate and defend those in need.